1. Thin and thin friends should choose a simple and simple style, elegant and elegant scarf, but the color should be warm. 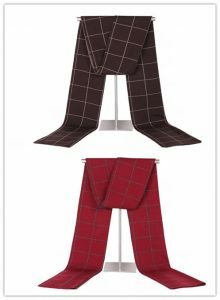 For those who are short and fat, it is advisable to use a loose knit scarf manufacturers or a silk scarf with a simple pattern, a darker color, and a single color, because the dark color has the effect of narrowing the visual sense and converging. 2. People with small concave chest and chest circumference choose a jacquard style, soft texture, fluffy, give a rich scarf is appropriate. 3. For those with narrow shoulders or shoulders, use a long scarf to hang the ends of the scarf diagonally on the shoulders, which will make the shoulders relatively thicker. 4. A person with a long neck, men can choose a thickened long scarf, so that the neck and shoulders, so that the neck is short; and young women should use a loose scarf around the neck, the color should be close to the top. 5. People with darker skin should not use a light-colored scarf, the neutral color is better, and the whiter skin should choose a softer color scarf. 6. Scarf fabrics used in different seasons: Spring and Autumn Festival: mostly cotton, modal, acrylic, and other thin materials; winter: mostly wool, wool, cashmere, and other warm materials; summer: silk, hemp Scarves are the mainstays. Round face: For people with a richer face, if you want to make your face look fresh and thin, the key is to lengthen the drooping part of the silk scarf, emphasize the vertical sense, and pay attention to the vertical line from head to toe. Integrity, try not to interrupt. When tying the knot, choose those tying methods that suit your personal style, such as diamond knots, diamond-shaped flowers, roses, heart-shaped knots, cross knots, etc., to avoid overlapping knots on the neck. Long face: The lateral system that expands left and right can show the flowing feeling of the collar and reduce the long feeling of the face. Such as lily knots, necklace knots, double-head knots, etc. In addition, the silk scarf can be twisted into a slightly thick rod shape, and the bow-like shape is formed. Do not over-tighten, try to let the silk scarf hang naturally, and render an Awkward feeling. Inverted triangular face: From the forehead to the lower jaw, the face of the inverted triangle face whose width is gradually narrower gives a severe impression and a monotonous feeling of the face. At this point, you can use silk scarves to fill the neck with a layered feel. A luxurious knot style will have a good effect. Such as rosettes with leaves, necklace knots, blue and white knots. Pay attention to reducing the number of times the scarf is wrapped around. The drooping triangle should be deployed as naturally as possible to avoid too tight a tightness and pay attention to the horizontal layering of the knot. Square face: A person with a wide cheek and a square face with a forehead, jaw width, and face length are basically the same, which is easy to give people a feeling of lack of femininity. When you wear a silk scarf, try to make the neck around the neck clean and clean, and put some knots on the chest, and then tie it with a simple line to create a noble temperament.